Total upped to 42 dead in the worst blaze in Israel's history, many of them Israel Prisons Service cadets. 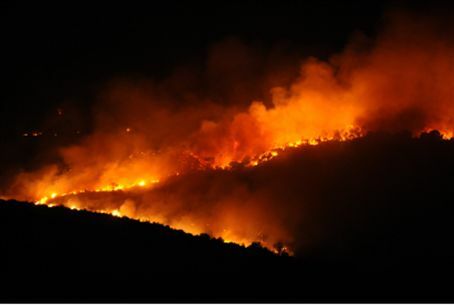 Dozens of security personnel, many from the Israel Prisons Service, perished in the fire that has been raging on the Carmel Mountain since Thursday morning. Twenty two people were confirmed dead by 7:00 PM Thursday and 14 more bodies were reported found shortly after 10:00 PM. The total number of dead orinialy estimated at 40, has been raised to 42. 36 of the victims were IPS cadets, most of them Druze, who were in their 20's. They were being transported on a bus after assisting in the evacuation of the Damon Prison. At a certain point the fire began spreading at great speed – covering a mile in five minutes, according to a firefighting officer – and the bus was caught in the flames with no chance of getting out.